It's easy to be cynical about jukebox musicals. For the past two decades modern musical theatre in both the UK and USA has been dominated by shows that mine the work of pop music artists and aim to tell the story of the singer or group or use the material to tell a more fragmented story that utilises their most popular billboard titles. Since the international success of Mamma Mia!, a move that's cemented to the post-9/11 need for feel-good entertainment on Broadway, jukebox musicals have received a somewhat rough critical ride with many within the industry willing for their demise rather than welcome the creative opportunities they inherently present. Within the genre there are obvious gems that have stood the test of time and proved to be almost critic proof in their longevity and popularity. Offering easier 'on ramps' to a different type of musical theatre audience they have helped shape and change the nature of theatre going in London and an audience's direct relation to what musical theatre has the potential to deliver on stage. 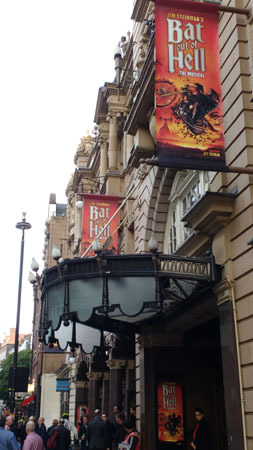 Those that appear to work best are those that are reinvented for the stage and provide a reason for existing within the new medium - something that Bat Out of Hell the Musical certainly achieves. For all Jim Steinman's success in the billboard charts he is without a doubt a writer of songs for the theatre. Whether performed by Meatloaf, Celine Dion or Bonnie Tyler, his music has an innate theatrical sense of scale and drama inherent in its structure and performance that has symbiotically helped theatre music dominate the charts in a similar way that the charts have come to dominate modern musical theatre. 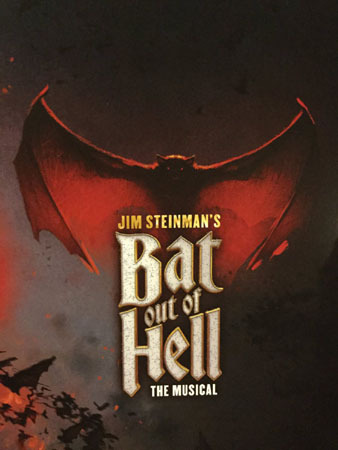 It is due to this narrative and musical complexity that Bat Out of Hell the Musical feels as much a necessary new piece of musical theatre as anything else seen in the West End over the past few years, and as a project some forty years in the making thoroughly deserves to escape such cynicism. Premiering at Manchester Opera House ahead of a run at the London Coliseum, Jay Scheib's production takes its cues from Steinman's score and is appropriately operatic in both scale and substance. Subtleties are abandoned in favour of the Wagnerian levels of performance that remains unlike any piece of musical theatre Manchester or London has seen. To describe the show in that manner is not to dismiss the levels of detail and scale of ambition in its design or presentation, rather highlight the soaring levels of visual ingenuity that feels European and unapologetic in its delivery, pushing and embracing the new medium and creating a highly successful piece of spectacular theatre. Utilising live video screens taps into the theatre of now and feels relevant in the wider theatrical context, linking the piece to its contemporaries such as 'City of Glass' by 59 Productions and 'The Kid Stays in the Picture' at the Royal Court. Within the vast scale of Jon Bausor's design it allows moments of fragility and uncertainly to be captured whilst offering a wide and varied visual that continues to mine depth and texture from the mise en scene. At times you're fearful to blink in case you miss a second of the staging or Emma Portner's appropriately agile choreography that finds its own lawless voice and gives familiar numbers an entirely new delivery. What Bat of out Hell the Musical lacks in narrative deft it more than compensates for in terms of casting and performance. Steinman's book allows his score to shape a world that's closer to that of a concept musical than a thoroughly linear story, and thanks to the commitment of the company this energy remains breathtakingly solid and undeniably effective throughout. Set in a non too clear futuristic dystopia the concept could use some early refinements in order for the audience to latch on to the piece's overall visual metaphor instead of using their brains to search for a tangible and clear narrative. Shadow's of Trump's America loom over the stage from the towering monopoly of Falco, head of the secret police who maintains an aggressive relationship with 'The Lost', the leader of which is daughter has fallen in love. Shades of 'Romeo and Juliet' cross with elements of 'Peter Pan' and 'Twilight' to create a world that feels suitably distant yet alarmingly real. Loosely plotted the true drama and narrative remains in Steinman's lyrics that help paint a world that has helped define his career and now feels tangible in its newly visualised state. Titles such as “Objects in The Rear View Mirror May Appear Closer Than They Are”, “In The Land of the Pig, The Butcher is King” and “Life is a Lemon (and I Want My Money Back)” are uniquely descriptive and blew expectations within the popular music chart when first released, but set against this anarchic theatrical backdrop seem a natural fit for creating and maintaining this ambitious world. It's the performances however that are really left to deliver the material and these are unanimously impressive, committed and refined. The mix of voice types adds texture to Steinman's musical world, from the richness of Danielle Steers to the dexterity of Giovanni Spano, giving full-throated support to songs you thought you knew yet never tire of hearing. Rob Fowler and Sharon Sexton fit the more traditional musical theatre roles yet impress as their voices collide with enough power to light a small city, bringing charm and new life to some of the most memorable musical moments whilst maintaining familial character tropes that show the piece's commitment to its chosen genre. In the lead role Christina Bennington offers a flawless vocal delivery of some of the most impressive Steinman songs, radiating a crisp energy that more than meets the demands these anthems deserve. Conflicted and constrained her character may not progress the plight of a damsel in distress but thanks to her auspicious delivery she cements herself as a breakout star of the piece. Equally matched by Ruben Van Keer as the alternate 'Strat' to leading man Andrew Polec, the key songs have rarely sounded more youthful and energetic and it's this that convinces you of their potential to succeed in a brand new context. Unlike anything you may have previously witnessed on stage Bat Out of Hell the Musical is a shot in the arm for modern musical theatre and offers audiences a fresh perspective on the music that has helped define a generation. Much more than a jukebox creation it offers audience a fresh perspective on a classic concept show and will be equally fitting in its operatic London home. Whilst Steinman has enjoyed stage successes around the world with Dance of the Vampires, one of the most successful musicals ever produced in Europe, his work on Bat Out of Hell feels at home within the frame of the proscenium and will no doubt prove as successful in this refreshing and visually arresting new context. In a coup for Manchester to provide the home for a new musical of this scale the piece has been supported by the local critics and audiences who remain blown away by its staging and innovation. Watching audiences of all ages rediscover the music in a new context was particularly thrilling, and die hard Meat Loaf and Steinman fans, who are perhaps the harshest critics of all certainly sounded convinced. As the show changes and develops for its London run it will open with a confidence in the material which is surprisingly rare for a new musical of this scale. The show will no doubt bring new audiences to the home of the English National Opera but will respectfully deliver a new type of musical that operates on a truly operatic scale and deserves to be experienced.